What’s usually the first thing we tend to do once we take home our new car? No, besides an Instagram post; that’s right – we clean the thing inside and out to maximize its vibrant allure, and emphasize our pride in ownership. Washing your vehicle isn’t just good for aesthetic purposes, it can also be great for protecting your car’s paint job, preventing rust, and minimizing depreciation. 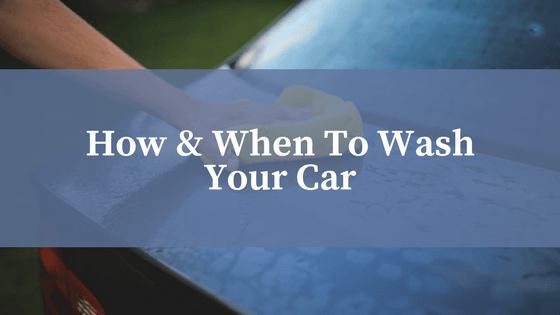 In this post, we’ll tell you about how – and when – to wash your car to take advantage of all these diversified advantages. With fall approaching, now is as good a time as ever. Why do we need to bother washing our car of dust and dirt? It’s a big tough metal box, right? It can surely handle a bit of road grime… Well, yes and no. Generally, driving is more impactful than you may think, and washing your vehicle by hand – the gold old fashioned way – is a fantastic way to familiarize yourself with the vehicle’s maintenance. Combing over the car while you wash will inevitably reveal tiny working points you can address yourself to maintain a car in good-working order. For example, you may find that your license plate bolts or frame is loose, or maybe that your headlight or taillight is cracked and allowing water inside. You may also find a missing air pressure cap, antenna, or a leaky door seal. Washing your car, in this regard, is a great way to prevent tiny problems from developing into larger problems down the road. Next up, your car is metal; you’re right. Metal is known to rust, while the paint on your vehicle helps to protect the material underneath. The paint is also protected by a layer of clear coat, sealing in, and maintaining the condition of both paint and metal. Without washing and protecting the paint and clear coat of your car, you run the risk of an accelerated rusting process, leading to potentially costly repairs and rot. Waxing offers yet another layer of protection from the elements be sealing the top layer of clear on your vehicle. Think of waxing as sunblock for your vehicle. Both carnauba wax, or polymer waxes work very well; carnauba is a natural wax that hazes and whitens as it dries, whereas polymer wax can be wiped off once it’s been applied. As you drive around, dust and dirt in the air compile on your vehicle, and at speed, have the potential to scratch your paint, however minimal it may appear. Over time tiny scratches on the paint finish become larger and can allow dust, dirt and water to penetrate the clear coat – salt water and salt used to de-ice roads in cold climates will accelerate the rusting process. Waxing helps to fill and protect those scratches from becoming bigger problems. As well as making the paint look oh-so good. Washing your car is a bit of a ritual. Everyone has their own process for getting a squeaky clean finish, but there is a method to the madness of waxing, washing, drying, and even using auto car washes. The best way to wash your car is to begin by filling a clean bucket with clean water, and using a car-safe detergent that’s safe on your vehicle’s paint job. Most department stores, or automotive stores will feature a plethora of respectable products that are more than capable of giving you a streak-free, shiny, and polished finish. Meguiar’s, Mothers, Optimum, and Armor All are all great brands to consider. Soaps you should avoid include any and all dish detergent soaps. These products, like Sunlight, Palmolive, or Dawn are all degreasers and cleaners that help tostrip wax and protectants away from the surface of the car. This will help to increase damage done to the paint job and clear coat of your vehicle by allowing dust and dirt to scratch the surface faster and more easily. Besides clean water and a clean bucket, great care is required to select an appropriate sponge or towel to use on your car’s surface. Natural fibres are best because they minimize the damage done to the clear coat or paint job. Natural wools and sponges don’t last as long as microfibres, but wool seems to be the gentlest and best material for washing and waxing. Washing your wheels and rims can be done with a brush, or a firmer material, as they can take a bit more of a beating than paint. You should always wash your car in a shady place, not in direct sunlight by any stretch. Washing your vehicle in direct sunlight speeds up the drying process, which can leave unsightly streaks or spots on the car’s finish – not a deal-breaker, but it can be avoided for a nicer, more polished finish. Wash wheels and tires first, eliminating brake dust and road grime from your vehicle’s surface. Take the dirty brake dust water and replace with fresh, clean water before continuing on to cleaning your car’s paint. A soap that’s rich, sudsy, and rich is lubricants helps to provide protection from scratches and dust accumulation. Use two buckets of water to prevent swirl marks, spots and streak on the finish. One bucket is for your car wash detergent, and the other should be set aside to rinse the vehicle after washing is complete. A hose works perfectly as an alternative to a second bucket. Wash in tight swirling motions, rather than long straight motions that can make scratches and markings more prevalent. Thoroughly rinse your sponge or microfiber material if it falls to the ground. Rinsing will prevent a piece of stone, dirt, or concrete from scratching your car as you continue to wash.
Rinse the car in sections, rather than soaping up the entire car and rinsing once at the end. Leaving soap on the paint can leave spots or streaks as the paint job dries. Consider breaking your car into sides, washing and rinsing four smaller sections. Use a shammy towel made of natural or synthetic material to prevent water marks that stem from soap residue and/or mineral deposits in water. For a streak-free shine, you may have to dry your vehicle a few times to ensure it’s dry to the touch. Instead of mopping up the water in a sweeping motion, it’s better to blotch up the water to prevent similar long scratches from occurring on the car’s surface. Ensure you’re well out of direct sunlight to prevent accelerated drying.